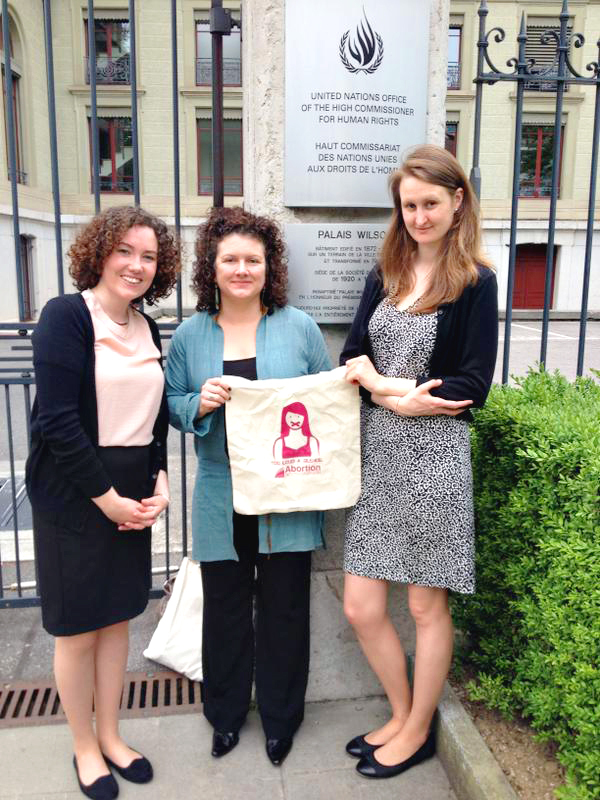 In June, we travelled to Geneva on behalf of ARC’s policy and advocacy team to bring the voice of Ireland’s pro-choice activists and individuals to the attention of the UN Committee on Economic, Social and Cultural Rights (CESCR). As a UN Treaty Body, the CESCR is made up of independent experts who monitor if states are implementing their human rights obligations. Having ratified the International Covenant on Economic, Social and Cultural Rights (ICESCR), Ireland is reviewed on how well it has been honouring its human rights commitments every five years. Ireland’s last review under this treaty was in 2002. Our work ranged from following the state’s official report on how well they’re upholding relevant human rights in Ireland to shadow reporting where NGO’s such as ourselves tell our side of the story, developing submissions and finally travelling to Geneva to engage in Ireland’s examination itself. ARC works from the grassroots to amplify the voices of as many rights holders as possible, including women and girls in Ireland who have never had the opportunity to vote on this issue, or those who are forced to travel abroad for basic medical treatment. From the grassroots speak-outs we host, where women tell their abortion stories in their own words, we consistently hear women recall insurmountable barriers to travel- including the cost of having an abortion abroad, the impossibility of obtaining visas to travel, or the difficulty of arranging childcare or time off work. The situation created by this so-called ‘right to travel’ actively discriminates against women and girls who are already marginalised and vulnerable. We raised these key points with the committee in our submission and urged the UN Committee on Economic Social and Cultural Rights to call for the Irish government to decriminalise abortion, and ensure equal and accessible abortion services within Ireland, thereby ending the legal and constitutional quagmire that has failed women in Ireland for so long. The UN Committee on Economic Social and Cultural Rights has often stated that criminalisation of abortion is incompatible with this international human rights law, and several other UN committees (UNHRC, CEDAW, UNCAT), and human rights experts have condemned laws that criminalise abortion as a violation of human rights. In a country where conversations about abortion are so highly stigmatised, it is easy to forget that the jurisprudence of international human rights law supports the decriminalization of abortion and the right of all women to exercise bodily autonomy. Over the course of the two day hearing, the Committee heard from a wide range of civil society organisations who felt that different aspects of Irish Law were in violation of the Covenant. The Committee then presented a list of questions to the Irish State representatives, which the State responded to one by one. When asked by a UN Committee how the state could reconcile the contradiction between the Irish constitution and women’s right to health as provided by the ICSECR, official representatives refused to answer directly, stating that the constitution prevents any increased access to abortion in Ireland and that there are no plans to change the constitution. As an advocate present at the oral hearings, this moment was a disheartening one, echoing last year’s examination by the UN Human Rights Committee. You are used to the state ignoring the voices of women in Ireland, but you hope that they will be forced to respond to a UN Committee. When they refuse to answer direct and simple questions even to UN expert panels on human rights in Geneva, it reminds you that change is hard won. However, neither the UN Human Rights committee last year nor the CESCR this year thought the state’s response acceptable. Members of the UN Human Rights Committee condemned not only the law but also the state’s use of the constitution to avoid their human rights obligations. This year, Committee members commented on Ireland’s violation of the ICESCR in relation to abortion law, noted that Ireland has some of the most punitive and restrictive laws around abortion and directly asked the state, if the constitution is preventing compliance with international human rights standards, why aren’t they holding a referendum? This recommendation reinforced that of the UN Human Rights Committee last year, meaning that the two authoritative bodies of the two primary International Human Rights instruments have stated clearly and plainly that Ireland’s abortion laws, namely the 8th Amendment to the constitution and the Protection of Life During Pregnancy Act, are in violation of International Human Rights Law. 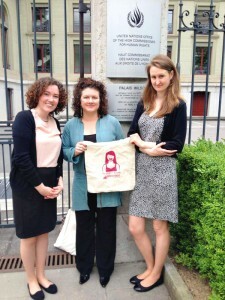 Although the state does not acknowledge that access to abortion is essential for the lives and health of women in Ireland, although they do not acknowledge that current laws are in violation of several major human rights treaties, although they do not seem to take the recommendations of numerous human rights committees seriously, we know that we are working alongside human rights defenders and experts the world over, that our advocacy and activism are valued and vital, and that our struggle is recognised and supported internationally. Fighting for reproductive rights in Ireland can be a lonely battle. The state has continually refused to engage on the issue and routinely ignores the rights of women and girls in Ireland. The issue is often portrayed as divisive and ‘dirty’. Factually incorrect arguments that Ireland’s laws are not in violation of human rights law continue to be entertained by mainstream media. As activists in Ireland you can easily feel isolated and stigmatised. But it was revitalising to receive the support and endorsement of yet another leading Human Rights Committee. To be reminded that this issue is not up for debate, but that restricted access to abortion constitutes a major violation of the human rights of women and girls, is an important reality check. Of course we should be fighting to change this. Of course we are not alone in this struggle.